I am all about my kids reading, with me or on their own. That is why I think it is so important for them to have a special area just for that. We are currently living in an apartment so right now we don’t have a play room where I would set up this area. So to solve this problem I got a teepee from Pacific Play Tents. 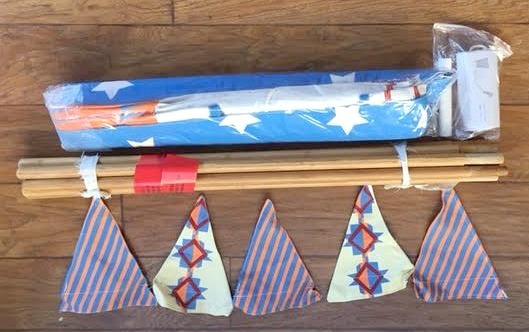 This way we can put up the teepee, currently in the dining area since we don’t have a table, and easily take it down when it is done being used. Now my kids have a fun area that encourages them to sit down and look at books or listen to me read to them on a daily basis. *I got the product listed below from Pacific Play Tents in exchange for my honest opinion. We went with the Vintage Cotton Canvas Teepee. 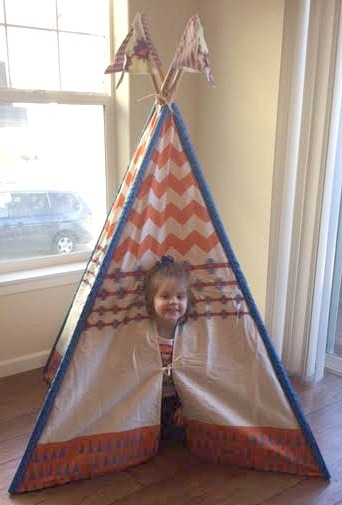 Pacific Play Tents has so many cute teepee options. We ended up going with the Vintage Cotton Canvas Teepee for two main reasons. The first being that it is ridiculously cute. The second reason was that it was a good color combination for it being for a girl and a boy. Did I mention it is ridiculously cute? I am a big fan of chevron so the orange chevron is what originally caught my eye. Then when you look inside the teepee the scene changes and it looks like you are laying under the stars. The different colors and patterns of the whole structure catches the eye and doesn’t make it an eye sore in your house, like many other children’s toys can be. Ok more than some, all of the assembly is required. What you get is the folded up shell of the teepee. It comes with 8 wood poles, 5 flags, 4 pvc pipe connectors and one small piece of rope. Putting the teepee together was easy, my 4 year old daughter was able to help. It took us about 5 minutes and the hardest part was sliding the poles into the sides of the teepee. Besides that it was quick and painless, my favorite way to describe putting together a child’s product. Easy to transport or store. Before you see all the supplies you will see this canvas storage bag. This is what all the supplies come in. This is great because when you are done you can store it away and have a lower chance of losing any pieces for future use. It is also great for if you want to take the teepee over to a friends house or when you need to pack it away during a move. It is quite remarkable to think how small this bag was and how large the teepee is sitting in my kitchen, what a difference! It is made out of canvas with the inside material being cotton. Just feeling the product for the first time I could tell that the material is good quality, especially for something that is going to be in the care of children. It can be cleaned with a wet towel which is nice for those inevitable spills kids make. There is so much to love about the Vintage Cotton Canvas Teepee. 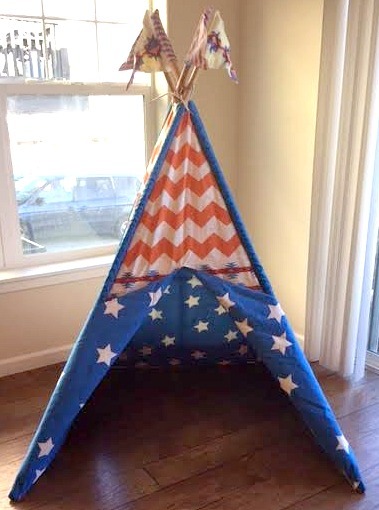 The inside of the teepee has plenty of room for at least two children, if not one or two more. There is also a lot of space for books or toys. Another great thing is that there is no bottom to the teepee so it is easy to place a small table or a couple of sleeping bags inside. There is also a cute window on the side to help the kids from not over heating while inside. 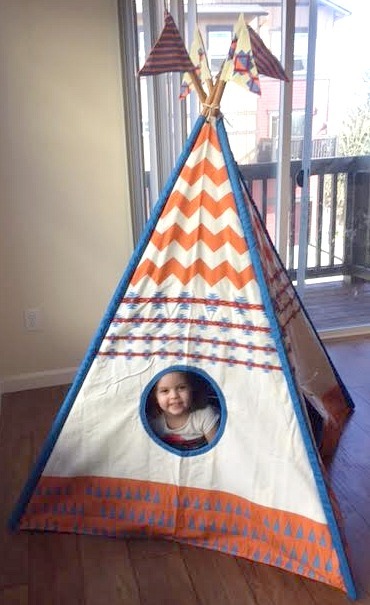 I can only imagine how much fun my kids will have over the next few years while playing together in their new teepee. 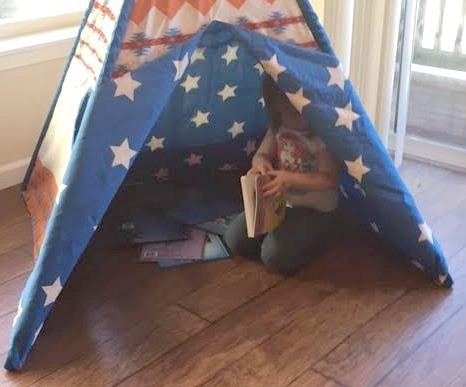 Have you checked out the Pacific Play Tents teepees? Which of them are your favorite? Let me know in the comments below!